In November of 1981, my little family of four happily journeyed to my parents’ house fifty miles away in Monticello, Arkansas. We were there for my husband Ted’s 33rd birthday celebration of his favorite hamburgers and fries. While my mother was cooking supper, I held our baby, Ashley, as Ted and our six-year-old son, Kelly, left to take care of some errands. However, as Ted was returning to the house, he had to stop and pull off the road because of very severe chest pains. He was able to drive back to the house, but, once there, he felt so weak and sick that he asked Mom to stay with him in case something happened. Later, when I wondered why he didn’t call me to help, he said I was busy taking care of the baby. Finally, he was in so much pain that we took him to the emergency room. After the young intern examined Ted, he thought he probably had Marfan syndrome, a connective tissue problem that affected the aorta. The doctor told us that the Ted’s aorta, the large artery that takes blood away from the heart, could get progressively worse and cause death or it could form an aneurysm and burst, causing immediate death. Ted’s aorta was evidently dissecting in stages, so the intern urged us to see a heart doctor right away. We soon discovered that the observant intern was correct. After consulting a heart specialist in Little Rock, we learned that the aortic valve and root could be replaced by an artificial valve or one from a pig. Because it would last longer, we chose the artificial one that would make Ted’s heartbeat “click” afterwards. We knew this was a very serious procedure, and were worried whether Ted would make it or not. Trying to take care of every necessary detail, we had our two-month old daughter Ashley christened in our church a few days before the surgery. As Ted proudly held her in the lacy white gown and pretty bonnet, I wondered if he would be there when she wore her next white gown and bonnet -- on her future wedding day. Though the Lord had assured me that I would be okay, I was concerned. I did not know if I would be fine with or without my precious husband. During the operation, several of us stayed in the waiting room for hours. Though Ted’s parents, our ministers, my brother, and I seemed calm on the outside; I know we were quite anxious on the inside. At last, the doctor slowly entered the room where we all stood waiting breathlessly. He quietly said that Ted had gone through the surgery—just FINE! Only then did I burst into tears of joy and relief. As we all hugged each other and rejoiced, we thanked the doctor for his skill and our God for His mercy and goodness. Later in December after Ted’s recovery, we attended a local church choir’s cantata entitled, “Home for Christmas.” As I held my sweet baby close and stood next to my son and his father, I praised our Lord that Ted was home with us, his family, at Christmas and not yet in heaven with our loving God. UPDATE: After Ted had four operations on his aorta, he passed away in 1999 at the age of 50. Until then, he lived a fairly normal life as a fine educator. Together, we raised two remarkable children who both have Marfan syndrome. Ted was not physically there at our daughter’s wedding in 2002. However, as my son escorted her down the aisle, we certainly felt his spirit and the pride he must have had for his two offspring. 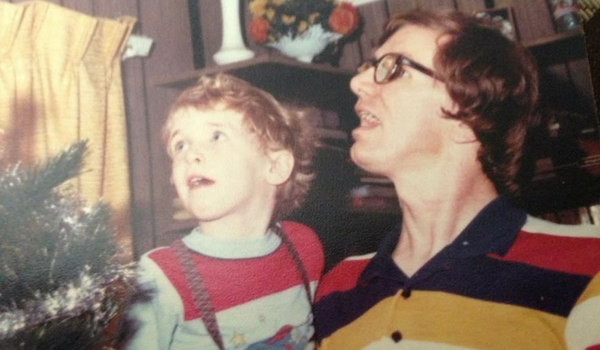 When I told my mother we might not have had them if we had known about Marfan, she shook her head. “Wouldn’t it be a sad world without Kelly and Ashley?” she quickly asked me. I wholeheartedly agreed with her and am grateful that we never had to find out. Auburn Ponder Anderson is a retired Arkansas English teacher who enjoys writing, church work, and grandchildren. 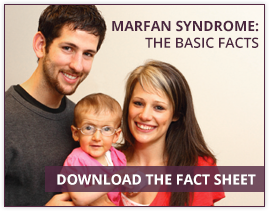 She learned about Marfan when her husband and two children were diagnosed.